This hearty rosemary baked ham and Munster cheese is fit for any size appetite. See below for what's in it. Easier than pie! Cut, butter and toast the bagel under the oven broiler. Add miracle whip or some other dressing you like to the toated bagel. Cut vegetables. Partly assemble sandwich on bagel beginning with red onion, tomato, stacked ham and cheese. On a lid rib baking sheet, return sandwich to oven broiler to melt cheese, less than a minute. You will need to watch it so as not to burn the cheese. Place lettuce on the bottom half of the bagel. 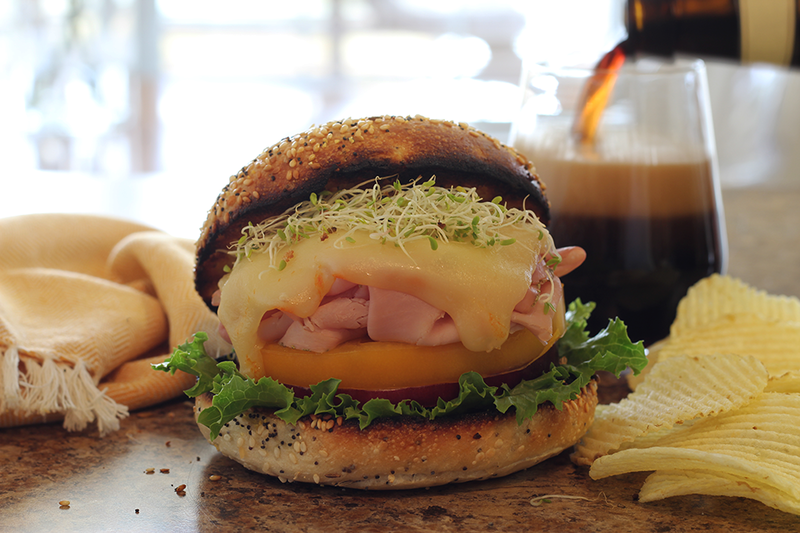 On top of the lettus, place the broiled vegie, ham and melted cheese. Finish with alfalfa spouts and bagel top. Cut in half or just grab it with both hands!